Notwithstanding ban orders, farmers are burning paddy stubble on their fields with impunity. Scenes of fire and smoke emanating from fields are common along the Hisar road, Rania road, Dabwali road, Barnala road and other paddy growing areas of this district. The Dakshin Haryana Bijli Vitran Nigam (DHBVN) has decided to increase the incentive to village panchayats for recovery of revenue from 5 to 10 per cent of the increased revenue over and above the present level of recoveries. In order to ensure safety of schoolchildren, the Transport Department has made it mandatory for school bus operators to install electronic speed-control devices in their vehicles. The Dera Sacha Sauda here has once again entered its name into the Guinness Book of World Records by organising a mammoth blood donation camp on August 8 that saw 43732 men and women donating blood. The managements of most of the high-end public schools, which get land at a concessional rate from HUDA and other government authorities citing public cause (like providing affordable education to the needy), show their true colours as soon as the land is allotted. “The Lok Sabha can be dissolved in the near future and hence, the possibility of a mid-term poll cannot be ruled out,” states former Haryana Chief Minister Om Parkash Chautala while addressing a press conference here. The Congress here is facing a tough situation over factionalism in the party. The recent spat between Mahender Pratap, Minister for Power, and Sharda Rathore, chief parliamentary secretary, who also has the status of a minister, has stunned the Congress circles. Both dignitaries are also MLAs from this district. Mahender Pratap Singh, Power and Labour Minister of Haryana, has said the state government has made sufficient budget allocation for development projects and officials should ensure that the projects are completed on time. The government will not tolerate any kind of delay on the part of the executing authorities, he added. The recent remarks of former RSS chief KS Sudershan against UPA chairperson Sonia Gandhi sparked protests from Congress workers throughout the state. Bharat Bhushan Batra, chief whip of the Haryana Congress Legislative Party and MLA from Rohtak, has been nominated by the Haryana Speaker to attend the fifth international parliamentary governance seminar (IPGS) organised by the Commonwealth Parliamentary Association, UK. A declamation contest was organised on “Rights and Duties” at SD Public School premises by the National Awareness Forum in which BD Thapar, founder of the forum, was the chief guest. The state government has decided to distribute as many as 21,763 bicycles free of cost among girls studying in government schools across the state under the Sarv Shiksha Abhiyan (SSA) so that they do not have to face any difficulty to reach schools in time. Guru Jambheshwar Science and Technology University (GJU), Hisar, has invited applications from aspiring candidates for the existing 130 PhD seats in 15 varied departments of the university. The applications should reach the concerned department of the university by November 22. A research paper of Dr Mahabir Singh Dhankhar, Controller of Examination at Deenbandhu Chhotu Ram university of Science and technology, Murthal, has been selected for presentation at the international conference GeoNZ 2010 to be jointly organised by the Geo-Science Society of New Zealand and New Zealand Geothermal Workshop from Nov.21-24 at the University of Auckland. Dr Neelima Shangla, Additional Sessions Judge, Kurukshetra, awarded life imprisonment to Ranbir, alias Banta Ram, of Bhiwani Khera (Kurukshetra) village , six-month imprisonment to Jaswinder of Matloda (Panipat) and three-year rigorous imprisonment to Labh Singh of Singhpura (Kurukshetra), under section 302, 438, 307, 427, 379, 279 and 336 of the IPC. As many as 16 promising poets were selected out of about 250 budding poets from various states of the country, who went for audition trials held by the Rashtriya Kavi Sangam (RKS), a noted national organisation dedicated to poesy, in Delhi recently. The wait to get a permanent stand seems to be getting longer for over 2,000 taxi owners in the city, who despite putting up repeated requests for the past five years have not been provided with any relief. The state unit of the CPM has expressed anguish over the trial court’s verdict in Aman Kachroo ragging and murder case and CBI’s report on cases of torture of Ruchika’s family members at the alleged instance of former Haryana DGP SPS Rathore. Concerned over reports of overloaded goods carriers plying on roads in spite of Supreme Court directions, the government has decided to make “overloading” a cognizable offence, punishable under the Prevention of Damage to Public Property Act 1984, with imprisonment and fine. The main circular road of the city is reeling under traffic chaos, thanks to lack of supervision that has added to the woes of the public. The road covers about 7-8 crossings and for the want of proper traffic regulation motorists park their vehicles haphazardly on the road during day hours. Hit-or-miss incidents, stray animals and parking of heavy vehicles like tractor-trailers are common on this road. Reliance Broadcast Network’s radio station Big 92.7 FM organised a Personality Development and IQ Test Camp and Counselling Workshop at the local Synergy Child Development Centre on the Children’s Day. With a view to ensuring social and economic uplift of deaf, dumb, mentally challenged and multi-challenged persons, the state government has decided to launch a scheme namely “Extension of Caregivers” in collaboration with the Union government and national trust. Scientists of the National Dairy Research Institute (NDRI) have advised farmers of the Garo tribe of Meghalaya to improve the breed of their cattle by artificial insemination and adopt scientific feeding for higher milk productivity. Sonepat, November 15“Lok Adalats have been our old and easy convention under which panches’ decisions used to give early justice to both parties and this convention has been made easy and convenient by giving it a legal status”. Parma Nand Jangir, national president of the Rashtriya Sahara Party (RSP), has flayed the Congress-led UPA Government for its failure to provide the requisite relief to the masses by way of curbing the spiralling prices of essential commodities. Projects for generating 128.06 MW of power from renewable energy sources have so far been set up by the Haryana government under its drive to promote renewable energy and improve energy efficiency in the state. Out of these, projects generating 52.20 MW of power were set up during last year alone. Sirsa, November 15 The first phase of the “Youth Energy Management Programme” for the district began recently with a five-day training programme for 50 teachers by the British Council with effect from November 9. Stubble burning is injurious to human health due to environmental hazards involved with it. The process is also harmful for farmers as several friendly pests that save crops from harmful pests are burnt in the fire. Heat generated by the fire also diminishes the fertility of the soil by burning micronutrients. The Punjab and Haryana High Court, in a civil writ petition CWP- 10138 of 2006, Capt Sarbjeet Singh vs State of Punjab and others, regarding non-burning of wheat stubble, paddy straw and dry fallen leaves, had directed the state government to take immediate remedial measures to stop burning of wheat/paddy stubble. Pursuant to the orders, the government had constituted a committee under the chief secretary to deal with the problem after the wheat-harvesting season this year. Owing to strict measures taken by the authorities, the problem had mitigated, if not ended completely, during the wheat-harvesting season. However, with the process of harvesting of paddy in progress in the state, the menace has started again. “We have no other option as we have to prepare our fields for rabi crops,” said a farmer at Odhan village. He said the alternative methods suggested by the authorities were costly as well as time consuming. Pankaj Chaudhary, additional deputy commissioner, who is holding the charge of DC these days, said she had asked the deputy director (agriculture) to initiate action against farmers after incidents of stubble burning came to her notice. She maintained that there was a complete ban of stubble burning and criminal action would be taken against farmers resorting to it. Sudhir Rajpal, Managing Director, DHBVN, said during a “Bijli Baithak” organised by the nigam at Badhra, near here, that in case a panchayat made efforts for timely payment of electricity bills by persuading consumers in its village, it will get 10 per cent of the amount that was recovered over and above the present level of recovery. The percentage of the incentive has been increased in view of the interest taken by the panchayat in the scheme. A number of panchayats have come forward in the area of operation circle Bhiwani and Hisar. Keeping in view the good response, the DHBVN has decided to launch the scheme in all 11 districts in its area. Regarding power supply on the domestic mode to “dhanis” (houses on the outskirts of villages), Rajpal said that the state government would bear 50 per cent of the expenditure incurred on shifting the “dhanis” from agricultural feeders to domestic feeder. The conditions for giving supply on domestic mode had been relaxed so as to reduce the expenditure to be borne by the residents of dhanis. The supply can be given in single phase or three-phase mode, as the case might be and a small transformer even of five KVA capacity could be used to connect dhanis on single phase. For cluster of dhanis within a radius of 300 meters, supply would be given by installing one single phase or three phase transformer near the colony, as per the load capacity. However, the facility of change of mode of supply would be given only to those dhanies where no bill amount was outstanding against the applicants. Meters would be shifted to poles, outside the premises. This was a onetime measure and not an ongoing programme, hence, it was meant for existing dhanis only as per the survey already carried out, he added. He said that demand notices had been sent to all those applicants in Bhiwani district whose applications for tubewell connections were received by June, 2009. As many as 547 farmers had deposited the charges responding to the notices. The process of releasing the connections to these farmers had already been initiated. The work would be completed in two parts. In the first part, all poles would be erected within two to three weeks so that there was no damage to crops. Thereafter, the work of release of connections would be completed on a war footing. Rajpal announced an increase in morning power supply to the domestic sector in the rural areas from two to three hours. The supply will be given in two groups from 4 a.m. to 7 a.m. and from 6 a.m.to 9 a.m. He said that as per directions of the Chief Minister, power supply to the tubewells would be ensured for eight hours a day. The latest measure came in the wake of complaints by parents and commuters that school buses move at a high speed, posing a threat to the lives of not only students but also road users. After installing the devices, the buses would not be able to ply on road with speeds exceeding 50 km/h. The limited speed would provide the bus driver with ample time to prevent any untoward incident. After passing the orders, the department has even stepped up its drive against school buses that do not have the device. The department conducts an annual inspection of all commercial vehicles during which the buses which do not have the said device would be weeded out. Sources said as of now two types of electronic speed-control devices were available, one which was installed on the fuel pipe and restricts the fuel supply to the engine and ensures that it never runs beyond a certain speed. The other is installed directly on the engine to monitor its working and it controls the speed accordingly. Both the devices run on battery and are quite effective in controlling the speed of the vehicles. As per traffic rules, school buses cannot run above the speed of 50 km/ph, but many drivers are seen violating the norms. As it is quite difficult to keep a check on the speed of each school bus, installing the new device is likely to put some brakes on the over speeding school buses. 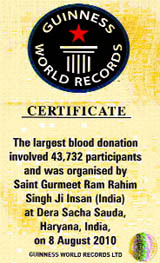 By doing so, the dera had shattered its own record of 17291 units of blood donated in a day on October 10, 2004. Even the third best world record stands in the name of Dera Sacha Sauda when 15,432 units of blood was collected in a blood donation camp organised on December 7, 2003. The dera has broken its own record twice since then. Blood bank teams from places as far as Hyderabad and Guntur in Andhra Pradesh, Maharashtra, UP, Uttarakhand, Delhi, Rajasthan and Punjab, besides various districts of Haryana, had collected blood in the camp on August 8 . The camp was organised to celebrate the month of birth of dera chief Gurmeet Ram Rahim Singh. His 43rd birthday fell on August 15 this year. Pawan Insan, a spokesperson of the Dera Sacha Sauda, said social service, which included blood donation, was the way of life for dera followers and 2,03,773 devotees had donated blood till October 31. In their lust to make more money,most schools deny quality education to poor children in gross violation of the Right to Education Act. At the most, many schools appoint a teacher or two to hold separate classes for poor students after the regular school hours. By not admitting the needy students to the regular classes, the schools create an inferiority complex in their minds. On the other hand, they circumvent the norms and exploit the parents of regular students by charging exorbitant fees in the name of building funds, admission charges, computer fee etc. Though there is a provision to resume land from the allottee(s) in the event of default/violation/non-compliance of the terms and conditions, it is never done as the officials concerned usually favour the schools for obvious reasons. Adhikar, a local NGO, had written to the Chief Secretary, pointing out certain instances of such violations by certain schools in Gurgaon. In response, KK Jalan, Financial Commissioner, Town and Country Planning, has directed the HUDA administrators of Gurgaon, Faridabad, Panchkula, Rohtak and Hisar to look into the matter. Stating that the issue raised by the NGO was correct, Jalan has asked them to look into the conditions of allotment of plots to different schools. The communiqué asks the HUDA administrators to make a policy to ensure that the terms and conditions are adhered to. He said the attitude and actions of Mamata Banerjee, Karunanidhi and some other leaders showed that they were not comfortable with the Manmohan Singh government. Supporting the formation of a third front, he said people were fed up with the governments led by the Congress and the BJP and were now looking for some alternative. He regretted that the Samajwadi Party had come to the rescue of the Manmohan Singh government on the issue of nuclear deal otherwise the government would have fallen. Chautala said it was good that Maharashtra Chief Minister Ashok Chavan was made to go “on corruption charges”. However, if the Central government was serious about eradicating corruption, it should order an enquiry into the deals of Chief Minister Bhupinder Singh Hooda who was involved in several similar deals, he alleged. “Hooda’s government has acquired large chunks of land from farmers at throwaway prices and given it to multinational companies and builders who made huge profits from it,” he added. The INLD supremo alleged that master plans for several projects were being frequently changed by state government for the convenience of its “favourites”. Quoting an example, he said land meant for industrial units in Manesar had been given to people who had no knowledge or background of entrepreneurship. In the past, the government used to conduct interviews of people willing to set up industrial units in such areas to ascertain their genuineness, he added. He alleged that several government officers “grabbed” plots at throwaway prices for their relatives and family members. The former Chief Minister regretted that the Hooda government had failed to pay any compensation to the farmers whose crops were destroyed in floods earlier this year. He said crime graph in the state was also on the rise. On the issue of disqualification of the five members of the HJC, who had extended support to the Congress, he said the court would be requested to set a time limit for the Speaker to take a decision. If those five members were disqualified, the government would be in trouble, he added. Sharda told Mahender Pratap at a public place that he was shielding those indulged in arson and vandalism at her office. According to her, the accused also include some BSP leaders. Sharda said this since one of the accused, who is also a councillor of the Faridabad Municipal Corporation, was present on the podium at a function relating to the Power Department. She also alleged that Mahender Pratap was putting pressure on the police for not arresting the accused. She also threatened to resign if the accused continued to be shielded. The Power Minister also retorted to her. B.Ojha, president of the Faridabad Congress, said it was the new low for the party on account of the behaviour of its leaders. He, however, also flayed the police for not arresting the accused. “It was shameful that the accused presented himself on the podium right in front of the police, which claims that it could not arrest them (accused) as they were absconding,” he said. According to him, it is shocking that the government functionary’s office was set on fire and the premises were ransacked by a mob headed by BSP leaders without any provocation. The criminals must be brought to book, he asserted. When asked why he was not interfering, he said he was not approached any of the two on the issue. Thus, it was up to the state president of the party and the Chief Minister to intervene, he added. He was addressing a meeting of district officers here recently. He said the timely completion of projects not only speeded up the tempo of progress in the state but also meet the requirements of people. “Agriculture and industry are the backbones of development and prosperity of any society and for the development of these sectors, electricity is the first requirement,” he said and added that the state government under the leadership of Chief Minister Bhupinder Singh Hooda had accorded top priority to the power sector. He also asked the officers to redress public grievances promptly. Ajit Joshi, deputy commissioner, assured the minister that the district officers would leave no stone unturned to complete development projects, extend the benefits of welfare schemes as well as in redressing public grievances. Later, the minister distributed as many as 385 cycles free of cost to labourers at a programme of the Haryana Labour Welfare Board. 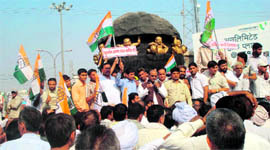 Congress workers held demonstrations at Fatehabad and Sirsa and burnt effigies of the RSS leader. Congress workers assembled at Arorwansh Dharamshala in the morning and later marched towards Laal Batti Chowk passing through Dharamshala Road, Jawahar Chowk, Shiv Chowk, Bighar Chowk and GT Road. The protest march culminated at the Laal Batti Chowk where the party activists burnt an effigy of the RSS leader. Congress leader Randhir Singh said that the comments made by K. Sudershan were a testimony to his own “state of mind”, adding that Sonia Gandhi and other members of the Gandhi family did not need any certificate from him. Senior Congress leader Krishna Poonia said that the Nehru Gandhi family has made several sacrifices for the sake of the country before and after Independence. 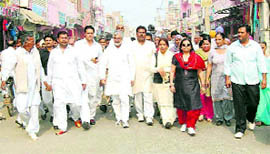 In Sirsa, separate demonstrations were organised by District Mahila Congress president Shilpa Verma, district Congress president Malkiat Singh Khosa and a former District Congress chief Hoshiari Lal Sharma against the insensitive comments by former RSS chief K. Sudershan. 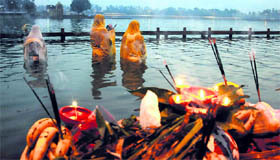 Supporters of Shilpa and Sharma burnt effigies of Sudershan. Sirsa MP Ashok Tanwar was present in the demonstration organised by Khosa. KAITHAL: Hundreds of Congress party workers led by District Congress Committee president Tejinder Pal Mann here organised a procession in protest against RSS leader K.Sudershan’s statement. The procession started from the local Congress Bhawan and workers carrying placards and raising slogans against the RSS leader marched on various roads. The protestors burnt an effigy of the RSS leader in the Pehowa Chowk area Addressing the workers Mann demanded an unconditional apology from Sudershan failin which the agitation would be intensified. Batra has already left India to participate in the seminar, which is being organized in London, Brussels and Cardiff from today to November 26. The programme will provide an opportunity to establish a greater understanding of principles and structures of governance. The delegates will have the opportunity to explore the practical implementation of the democratic principles of scrutiny, accountability, equal and fair participation, and national and international co-operation. The seminar will be attended by several members of the House of Commons, members of the International Court of Justice and the UN. Batra, a law graduate from Delhi University, has an experience of more than 30 years as an advocate and has served as the Chairman of the Haryana Public Service Commission. He was also a Director of the Oriental Bank of Commerce. He was first elected as a member of the Haryana Vidhan Sabha in 2009. His father, Satram Dass Batra, was also an MLA from 1967 to 1977. Children from classes IX to XII got an opportunity to express their views, concerns, hopes and aspirations in the presence of their parents, teachers and policymakers. They spoke on the importance and principles of “Rights and Duties” and their practical manifestation within day-to-day life. They emphasised children’s right to expression and opportunities to grow to their full potential through access to basic health and quality education. Speaking on the occasion, Neelinderjit Kaur Sandhu, principal of the school, said: “Education is the basic right of every child. When education is denied, children remain ignorant of their rights, which leads to their exploitation. I believe that if children are educated today, they will take the responsibility tomorrow to ensure a better future for our country”. Thapar appreciated the efforts of the school staff and the principal and encouraged the students and advised them to be particular about their duties towards their country, society, family and school. He said children face poverty, abuse, forced labour and lack of growth opportunities, but the worst enemy is illiteracy. Thapar distributed prizes to Sonali, Keertika of class IX and Anandita from class XI who got first, second and third positions, respectively. Participation certificates were given to all participants. Principal Neelinderjit Sandhu and Surinder Juneja, member of the management committee, congratulated the winners. Haryana Education and Health Minister Geeta Bhukkal stated this while addressing a gathering during a function held at Panchayat Bhawan here recently to implement the first phase of the decision. She presented free bicycles to 50 girl students of various schools at the function. “Bicycles will be given to those girls who are in class VI and have to cover about 2-km distance to reach their institutions,” she maintained. 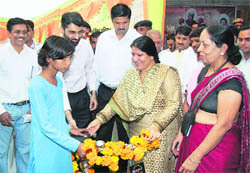 Dedicating this year’s Children’s Day to curb foeticide, the Minister administered the oath of saving girl child to people present in the function. “Anganwari Centres in the state are being given a new look, so as to provide better facilities to children. The children coming to these centres are being provided nutritious food to keep them healthy. Free picnic bags are also given to the children to encourage them to come to these centres,” said Bhukkal, adding that there was also a project of providing cookers of 25 litres capacity to Anganwari Centres. Earlier, she also launched Pulse Polio Campaign from here by administering polio drops to children in the age group of zero to five. The Minister informed that the campaign was being conducted in 13 districts of the state and polio drops would be administered to about 26 lakh children under the campaign. Bhukkal urged officials of the Health Department, workers of Anganwari Centres, voluntary organisations and guardians of the children to get polio drops administered positively to the children in the age group of zero to five to eradicate polio. Dr ML Ranga, vice-chancellor, GJU, said while Sir CV Raman Research Scholarships of a monthly quantum of Rs 18,000 each, along with Rs 5,000 as contingency expenses per month, would be given to as many as 15 PhD scholars, one monthly university research scholarship of Rs 5,000 by each one of the 15 departments would also be made available to the scholars. He further said while an admission test combined with academic record of the candidates would form the basis of their selection, written admission test of the above departments would be held on December 4. JRF-passed candidates could tender their applications for admission to PhD course in the above departments, added Dr Ranga. GJU registrar Prof RS Jaglan said the department-wise availability of seats presently stood as: Electronics and Communication Engineering-1, Environmental Science and Engineering-10, Chemistry-20, Physics-15, Mathematics-2, Bio and Nano Technology-8, Pharmaceutical Science-4, Food Technology-7, Mechanical engineering-7, Applied Psychology-4, Computer Science and Engineering-7, Communication Management and Technology- 6, Advertising Management and Public Relations-4, Religious Studies-2 and Haryana School of Business-33. He further said two Sir CV Raman Scholarships each in Computer Science and Engineering, Mechanical Engineering, Environmental Science and Engineering, Bio and Nano Technology and Pharmaceutical Science as well as one such scholarship each in Electronics and Communication Engineering, Food Technology, Chemistry, Mathematics and Physics would be made available to scholars. He also said while the admission test would be based on objective-type questions whose department-wise syllabus could be had either from the department concerned or the university website, online application forms and other requisite information could also be had from the university website: www.gjuast.ac.in. The title of this paper is “Static Deformation of a Uniform Half-Space due to a very long tensile fault” published in a reputed journal of Earthquake Technology of IIT, Kanpur.The research paper deals with post-seismic study of an earthquake. Dr. Dhankhar is the only Indian scientist to participate in the conference. As many as 200 scientists in the field of geoscience and geothermal have been invited to conference from all over the world to present their research work. According to the case history, a petrol tanker (HR33-H-2186) overturned on Jhansa Road, near Bhiwani Khera village near here on April 17, 2008. The villagers started collecting petrol spilt from the tanker in containers. Labh Singh and Ranbir, alias Banta, started quarrelling over collecting petrol. Ranbir got enraged and he set on fire the spilt petrol. Many persons, including Suresh, Rakesh, Rajesh, Manish, Anil, Ram Karan, Raj Kumar, Gurmit Singh and Amarjit sustained burns injuries while a motor cycle and the whole petrol of the tanker was burnt. Amarjit, Raj Kumar and Gurmit Singh later succumbed to their burns. The selected poets, who belong to a new emerging generation of talented poets, include Vani Guarava Golcha, Sumit Mishra, Anita Sharma, Rohit Chaudhary, Nishant Jain, Parth Navin, Radha Kant, Sachin Agarwal, Alok Bhandoria, Anjum Sharma, Laxmi Bhatt, Master Mahender, Suman Sharma, Anil Shrivastava, Anurag Pathak and Shyam Vashishtha Shahid. It is a matter of pride for the people of Haryana that three of them, Alok Bhandoria (Rewari), Master Mahender (Jhajjar) and Shyam Vashishtha Shahid (Bhiwani), are from the state. 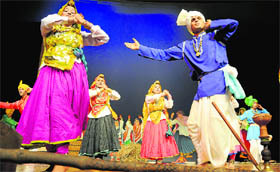 It is noteworthy that Alok Bhandoria (24), who is a grandson of late Master Neki Ram, an eminent bard, folk musician and a sangi (performer of operas) of the Ahirwal region, has been composing verses in Hindi as well as Haryanavi under the directions of noted poet Halchal Haryanavi for the past one decade. According to information available from Jagdish Mittal, national convener of the RKS, these poets will now recite their lyrical compositions at the fourth Kavya Utsav titled “Dastak Nayee Peedhi Ki” (poetic rap of the new generation of young lyricists) to be held under the auspices of the RKS at Teknia Auditorium at Rohini in Delhi on November 16. Mittal further informed that while BJP chief Nitin Gadkari would be the chief guest, Indresh Kumar, director of the RKS, would preside over the poetic fiesta. Besides, noted veteran poets Bal Sawrup Rahi and Arun Gemini as well as eminent scholar Prabhat Jha would bless the young lyricists. Though the office of the district town planner had initiated some measures to set up a taxi stand in Sector 25, the proposal remained dumped in official files and till date nothing concrete has come out. At present, more than 1,500 taxis are parked haphazardly along roads in areas like Model Town, Barsat road, Gohana road and sabzi mandi. Around 500 taxis remain parked in service lanes opposite Skylark Tourist Complex, which frequently leads to jams on the NH1. In the absence of a permanent stand, the taxis owners also have to face the wrath of law officers, who, while discharging their duty, have to deal with them sternly. The owners lament that for the past five years they have been urging the authorities to provide them some place where they could park the vehicles and do business without violating any norms. Even as two district officials in the past moved proposals to allot land near Mittal Mega Mall in Sector 25 from where HUDA could charge fee from taxi owners, their efforts proved futile as no decision was taken by the authorities. The office of the district town planner had also prepared a proposal to set up a taxi stand in Sectors 13 and 17, but the proposal failed to take off. Meanwhile, the unorganised way of parking of taxis in various parts of the city has become a source of nuisance for commuters. Traffic jams can be seen in most of the areas where taxis are parked. Inderjit Singh, state secretary of the party, said both these developments had caused resentment among law-abiding citizens. He described the conduct of the CBI, which has directly benefited the tainted cop, as dubious and questionable. He urged upon the Haryana Chief Minister to ensure legal remedy in accordance with his public assurances in this regard. The leader maintained that the quantum of punishment in Aman Kachroo case was inadequate as it was a clear case of murder of a medical student belonging to Gurgaon, which had evoked widespread public outrage. Expressing solidarity with Aman’s parents, Inderjit Singh said their disappointment with the trial court’s decision was understandable. He cautioned that it would cause setback to the efforts towards curbing the uncivilised and inhuman practice of ragging. The State Transport Commissioner has directed all Deputy commissioners and SPs to take action against the “erring” vehicles and book the drivers, cleaners, owners and permit holders under relevant sections of the PDP Act as overloaded vehicles caused wrongful loss/damage to roads and also lead to accidents. Overloading could attract imprisonment up to five years and fine under the provisions of the Public Property Act and the Motor Vehicle Act. In order to strictly implement the directives of the Supreme Court and orders of the state government issued on November 8, 2010, the Karnal police launched a special drive and seized 25 “overloaded” vehicles within 48 hours. “As many as 22 vehicles were seized on November 9 and criminal cases registered in respect of five vehicles while the remaining vehicles were challaned by the Regional Transport Authority (RTA)”, Karnal SP Rakesh Arya said. The letter issued by transport Commissioner clearly stated that overloading was a “cognizable and punishable offence” under section 3(2) of the PDP Act and anybody found guilty would be booked under this section for “mischief causing damage to public property” and action would be taken against the drivers, cleaners, owners, permit holders and all other connected with the offence. Earlier, the overloading of vehicles was checked by the RTO and in most of the cases, overloaded vehicles were going scot-free. It was worth mentioning that most of the highways in the state were damaged by unchecked movement of overloaded vehicles and most roads were potholed. Though the city has a separate auto market at Loharu road, auto workshops here have added to the chaos since mechanics do not care about traffic problems and start repairing vehicles either on the road or footpaths. The administration has started constructing dividers on the circular road, but it might not ease the traffic pressure unless the road is widened. The dividers are thus adding to the congestion. Traffic police personnel are deployed only at Ghantaghar chowk and Rohtak Gate while other crossings are least cared. Vehicles could be seen parked in a haphazard manner even at Rohtak Gate where cops are present. A large number of parents accompanied by their teenaged children attended the camp and the workshop. Psychologists of the centre took test of participants to assess their IQ, personality, educational profile, stress management abilities and career profiling. On the basis of individual profiles created through these tests, psychologists counselled children and their parents. Parents were informed of what they should do to help their child pursue his or her interests. Siddharth Bhardwaj, vice-president, Big FM, said the organisation had decided to organise the workshop on the Children’s Day as a special gift for teenagers. The exercise helped identify the talents of participants on the basis of which they were counselled about their career prospects. He said more such activities would be conducted in the future to help children realise their dreams. Disclosing this in a press release issued here, Haryana Education, Health, Social Justice and Empowerment Minister Geeta Bhukkal said caregivers would be appointed for care of multi-challenged children so that they could be brought up in a manner. Besides, the government was also mulling over starting of the Niramaya Bima Scheme for mentally challenged children, she added. The Minister said special institutions would be opened at the district level at a cost of Rs 150 crore under the Jawahar Lal Social Infrastructure Scheme that was recently launched by the state government for the welfare of physically challenged, senior citizens and children. A part from this, a state-level mentally challenged centre was also being established in Rohtak. “Pension for physically challenged has been increased from Rs 300 to Rs 500 per month for those who have 70 per cent or more disability and from Rs 600 to Rs 750 per month for 100 per cent disabled persons. Similarly, educated physically handicapped unemployed persons are provided unemployment allowance under the unemployment allowance to physically handicapped persons scheme,” Bhukkal said claiming that the government was not leaving any stone unturned to empower physically and mentally challenged persons. Under the scheme, monthly allowances of Rs 200, Rs 250 and Rs 300 were being given to those who have 70 per cent or more disability according to their qualification. Also, 100 per cent physically handicapped educated unemployed persons were being provided with Rs 1,000, Rs 1,500 and Rs 2,000 per month, the Minister maintained. Bhukkal informed that retainership allowance of visually impaired persons posted as caners had also been enhanced from Rs 1,500 to Rs 3,510 per month and scholarships ranging from Rs 100 to Rs 750 per month were being provided to physically handicapped students as well. A group of 10 farm women and 10 farmers of Garo tribe from five villages of the Turu area, who visited the NDRI here, were explained how cross-breeding had improved the breed of indigenous cattle and increased milk production and productivity and shown the elite herd comprising cross-bred, indigenous cattle and buffaloes. Dr Dalip K Gosain, head, Krishi Vigyan Kendra (KVK) and Dairy Training Centre of the NDRI, who interacted with Garo farmers, said best feeding practices and shelter management pertaining to hilly conditions was explained to the group and tips pertaining to breed improvement, feeding, shelter management and clean milk production were given. Garos are one of the few remaining matrilineal societies in the world where individuals take the clan titles from their mothers and traditionally, the youngest daughter (nokmechik) inherits the property from her mother. Dr Gosain said milk production was as low as 3 litres per day and nearly 90 per cent farmers milked their cows only once a day in the morning unlike milking of cows and buffaloes twice a day as being done in Punjab and Haryana. A leading member of the group, MN Sangma told that nearly 90 per cent of the farm families in his village named Wall Bakgi, usually milk their cows of local breed one time and get 1-3 litres of milk per cow and nearly five per cent farmers have adopted stall feeding. The visiting group informed that the farmers were feeding rice straw with grasses and tree leaves to their cattle and Dr Gosain informed them about the benefits of scientific feeding. The Garo farmers were using some of the cows, which were unable to conceive or giving very less milk, for ploughing fields and the milk production was so low at times that some families in the rural areas take black tea, said Bloom Field Marak, a member of the visiting group. Talking about the work distribution in dairying, Bloom smilingly said that both men and women did almost equal work but being matrilineal society, men did more hard work and young girls were rarely engaged in it. Elvera Momin, group leader from the Horticulture Department, said the visit was beneficial and adoption of the shared technologies would help in improving their dairy farms. This was stated by District and Sessions Judge Manjit Singh while addressing a state-level special legal aid camp organised by the District Legal Aid Services Authority in Geeta Vidya Mandir Girls College here recently. Manjit said two types of cases, one those lying pending in courts and others not in courts, were decided in Lok Adalats. Besides, cases of civil, marriage act, revenue nature, criminal cases, except murder, were also being decided through Lok Adalats. “Poor people are being given free legal aid to pursue their cases in these adalats,” he said, adding that if any fee was to be charged, it was being taken as per the set criteria and after every three months, a mega Lok Adalat was organised for giving cheap and speedy justice. Manjit, who is also the chairman of the District Free Legal Aid Services Authority, informed that under the provision of the free legal aid service, people with less than Rs 50,000 annual income, widows, ex-servicemen, factory workers, women, freedom fighters and Scheduled Castes were given free legal aid. “The decision given in Lok Adalats was final and there was no appeal against this decision,” he said. Chief Judicial Magistrate Major (retd) Phalit Sharma said as many as 586 cases had already been settled in the district after giving free legal aid service in these cases. The district authority had also been educating masses about the provisions of free legal aid service and of other laws by organising seminars in villages and educational institutions, he added. On behalf of the District Legal Services Authority, advocate BD Gaur explained the provisions of the maintenance and welfare of the Senior Citizens Act, 2007, advocate Sudesh Panghal gave details of the Child Labour Act, advocate Rajesh Dagar briefed the audience on HIV and Bhanu Gaur described about the legal provisions against domestic violence. District revenue officer Suresh Kumar, district primary education officer Shiela Balhara, principal of GVM College Dr Jyoti Juneja, representatives of different social organisations, government officers, revenue patwaris and gram sachiv were present in the camp. Addressing a party workers’ meeting here , he said the recent hike in the prices of petroleum products as well as the cooking gas had aggravated the woes of the common man. He appointed Daulat Ram Jangir from Dharuhera as president of the state unit of the Backward Classes cell of the RSP. According to Power and Renewable Energy Minister Mahender Partap Singh, a small hydro project of 6-MW at Dadupur started power generation in March 2010. Another 2-MW hydro project was commissioned at Gogripur in district Karnal in September 2010 and two hydro plants of 2.8 MW are likely to be commissioned during this financial year. Three biomass cogeneration projects of 2.5 MW capacity are also being set up in private industries at the cost of Rs 11.25 crore. These projects are also likely to be commissioned by the end of the current financial year. He said under the scheme of power generation from industrial and commercial effluents, a 1MW distillery-effluents based power project has been commissioned at Ashoka Distilleries, Hathin, in Palwal district at the cost of Rs 4 crore during the current year. A similar power project of 3MW at Globus Spirits Limited, Samalkha, in Panipat district has also been sanctioned by the Union Ministry of New and Renewable Energy, which is also likely to be completed this year. HAREDA has also implemented a special project of providing 5,635 Solar Photovoltaic (SPV) Home Lighting Systems in 11 villages - Ludas, Nathwana, Mangali, Jhara, Balwas, Sulkhani, Kharkhara, Gaibipur, Sahu, Mothrangran, Hagampur and Bir Hansi of Hisar district having 50 per cent or more Scheduled Castes population. The agency has also prepared another special project for installation of 6,660 SPV Street Lighting Systems in 333 villages of Sirsa district at a cost of Rs 12.65 crore. With the completion of installation work by December 2010, Sirsa would be India’s first solar district. The first phase of the “Youth Energy Management Programme” for the district began recently with a five-day training programme for 50 teachers by the British Council with effect from November 9. The European Union-funded project on vocational education and training for vulnerable and marginalised groups is being implemented in partnership with the British Council, the CII and the City & Guilds, UK, in two backward districts of the country - Sirsa in Haryana and Sitapur in Uttar Pradesh. The project focuses on skill development in the sectors of agro-processing, manufacturing and tourism to increase employment opportunities. The British Council had earlier selected teachers from Senior Secondary Schools, Industrial Training Institutes (ITIs) and Polytechnics for the training.